A Gravid trap, lures pregnant female mosquitoes by creating a false breeding environment. Most people would like it if mosquitoes would just go away. Staff at the Kent County Health Department is collecting them by the thousands and they want more. Now through Labor Day, KCHD will place, monitor and maintain 11 mosquito traps in the following zip codes in the county 49503, 49507 and 49519. The goal of monitoring is disease prevention, specifically West Nile Virus (WNV). 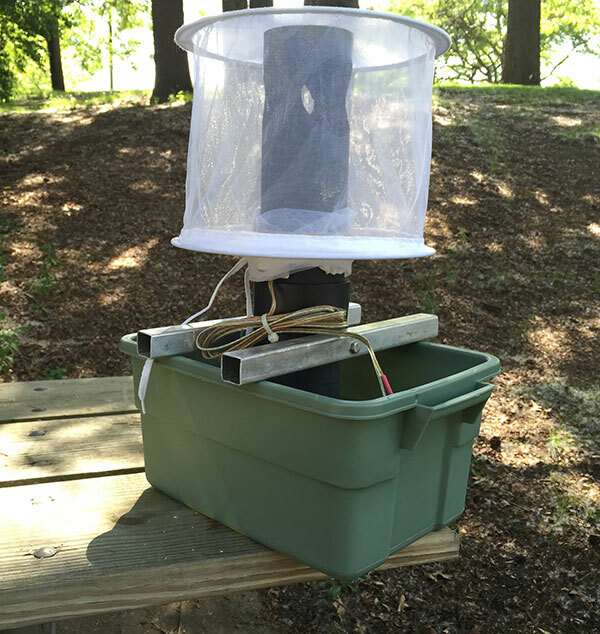 The trap, called a Gravid trap, lures pregnant female mosquitoes by creating a false breeding environment. A pungent bait of grass clippings and yeast fools the insects by attracting them with carbon dioxide, a gas found in the exhaled breath of mammals. 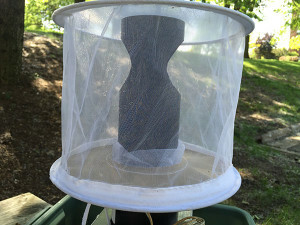 Mosquitoes end up sucked into a nylon net by a battery operated fan. Each week, the mosquitoes that get trapped will be returned to KCHD where they will be pulverized and tested for West Nile Virus and other mosquito-borne illnesses. Results will be logged along with geographic information that will provide a nearly real time picture to health authorities. The best treatment for WNV is prevention. The Kent County Health Department recommends wearing a mosquito repellant that contains 10-35 percent DEET; wearing light colored clothing; and staying indoors during dusk. You can help stop mosquitoes from breeding by removing any standing water in your yard and keeping your lawn and shrubs cut. A grant from the Michigan Department of Health and Human Services is funding the project.